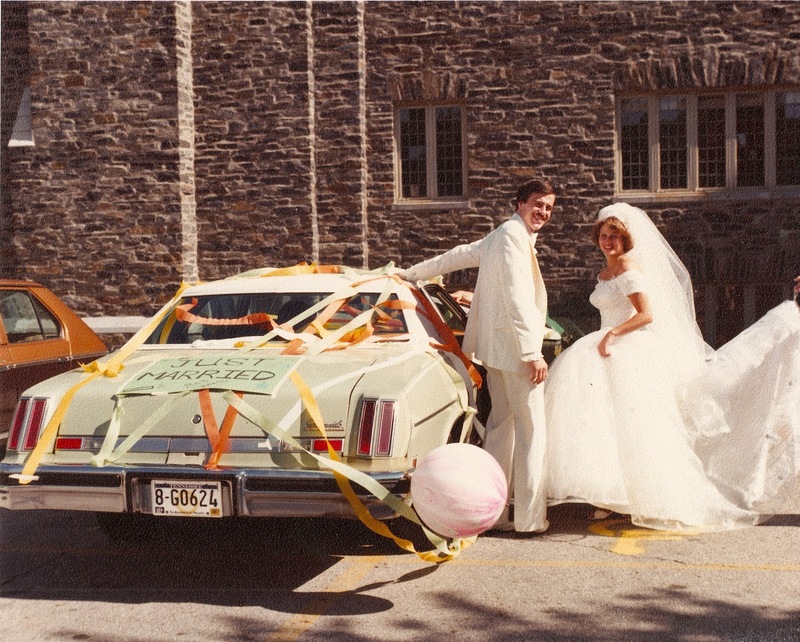 Today marks the anniversary of one of the most exciting, nerve-wracking, and happiest days of my life: my wedding. Every once in awhile, I pull out the album of 8”x10” wedding photos that my parents purchased from the photographer. This year, I decided to take the time to archive the photos. Like a lot of family historians, I tend to get caught up with documenting and preserving the distant past, while letting the recent past slip by. Yet why should archiving the events of our own lives be any less important than the lives of our ancestors? Remove the photos from the album and scan them to iPhoto on my computer. The album, thankfully, isn’t one of those magnetic ones that were so common in the 80’s, but it does have some sort of adhesive at the edge of each sleeve that is starting to erode and leech onto the pictures. 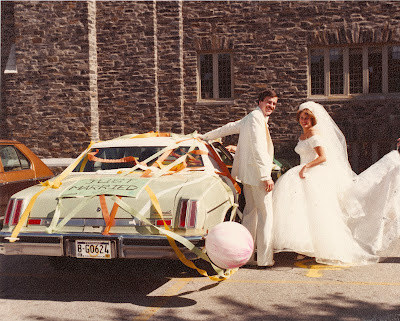 Write an identifying caption on the back of each picture using an archival-safe ink pen. Replace the photos in the album (to preserve the order) until I can buy a new, archival quality 8x10 album to put them in. Put all the digital scans together as an digital album in iPhoto, cleaning each one up as necessary. Enter metadata to identify the people, place, and date for each photo. Burn two DVDs of the digital album, label them, and put them in different places. Back up my computer to an external hard drive and Mozy. Yes, it takes some time, but it’s nothing compared to the time that went into planning the wedding. And aren’t those memories worth it? This marks the 200th anniversary of the day President James Madison declared the United States of America to be at war with Great Britain and its American Indian allies. Overshadowed as it is by the Revolutionary War and Civil War, the War of 1812 often gets the short end of the publicity stick. But for awhile at least, it gets to take center stage. Even though I haven’t yet found an ancestor who served in the War of 1812, I feel a kind of connection to it. You see, my city—Columbus, Ohio—was born along with the war. It was created by the Ohio legislature in 1812 to be the new capital of the state, largely because of its handy central location and river access. Nearby Franklinton (now absorbed by Columbus) was already a hub for staging troops and munitions for the war effort. Because Ohio was America’s western frontier at the time, it was on the front lines of the conflict, particularly as the nations wrestled over control of the Great Lakes and strategically-located western forts. Sometimes in my quest to gather records, documents, and snippets of history, I tend to forget that the outcome of these wars was anything but assured. 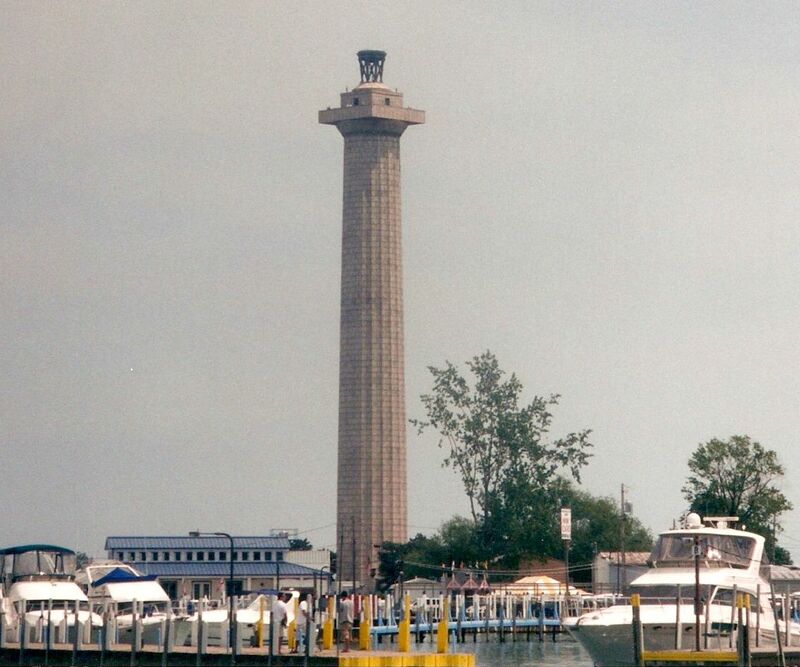 What if Commodore Perry had not defeated the British in the Battle of Lake Erie? Put-in-Bay today is a happy-go-lucky island, an Ohio version of Key West. But back then it was ground zero for a desperate fight. If the British had won control of Lake Erie and taken Put-in-Bay, what would stop them from taking control of Cleveland and Sandusky, a short boat ride away? What if Fort Meigs had fallen, like Fort Detroit and Fort Dearborn (Chicago) did, leaving much of the Northwest Territory virtually defenseless? Our maps and our stories today could be very different. 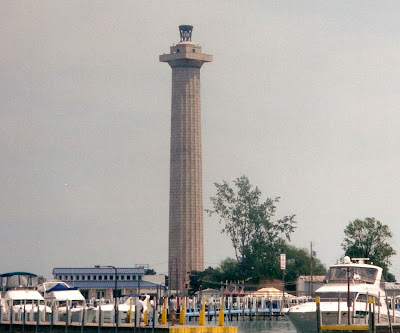 I’ll try to share a few resources for learning about the War of 1812 and the men who served in it as the weeks go on. For now, I invite you to read a brief synopsis of the war’s history and impact on Ohio in an article, “The Fight that Forged Ohio,” that appeared in the June 17th edition of The Columbus Dispatch. I think reporter Ken Gordon did a good job with it. And I’d encourage you to take a look at Derek Davey’s article, “Genealogically Speaking: The War of 1812,” in the June issue of The In-Depth Genealogist newsletter. He explains the role that geography played in the war, and makes some great recommendations for finding service records and using various types of resources to study War of 1812 ancestors. I hope to find a War of 1812 soldier in my family so I can try Derek’s suggestions myself. I’m curious to know how many others have identified an ancestor who played a role in this conflict. Have you found or researched someone who served in the War of 1812? Happy Father's Day to my Dad, and to all the Dads who've cherished those small, sweet kisses. Maps and history go hand in hand. While they may not be the first resource that springs to mind, maps and atlases are great visual aids to learning about your family history as well. While a current map or atlas will do, there’s nothing that compares to a historical map created around your ancestor’s lifetime. I’ve found that studying an old map can open my eyes and give me ideas about things I might not have thought about otherwise. Historical maps can help you visualize where your ancestors lived, recognize the waterways and natural features of the area, and identify towns and cities where they might have left records. And maps are particularly crucial for understanding how an ancestor migrated from one place to another. On a map, it’s easy to see why rivers, creeks, and lakes were such important routes of travel, and how mountains stood as such formidable barriers to settlement. Some maps illustrate changes in county and state borders. Others show the routes of early roads, canals, and railroads. So where do you find these gems? Libraries and archives, certainly, are great places to start. While almost all libraries have maps and atlases, some boast particularly impressive collections. But what if you live far from the area you’re interested in? Well, we live in a wonderful age. 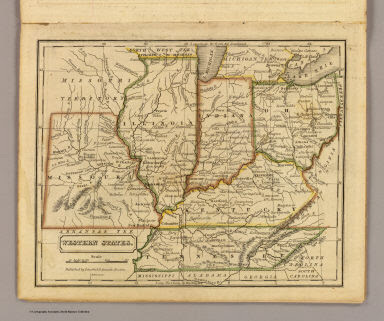 Many libraries and even private collectors have been busy digitizing their map collections and making them available online, free of charge. Long story short: the internet has made finding historical maps and atlases easier than ever before. David Rumsey is a cartographer who has amassed one of the largest private historical map collections in the U.S., if not the world. Over the last decade or so, he’s created high resolution scans of about 32,000 of his maps and made them freely available on his website. The more time I spend exploring his site, the more treasures I find, like this map of the (then) Western States, published in 1832. The viewing tools are amazing. Best of all, you can export and print his maps for your own non-commercial use under a Creative Commons license. Created by the University of Alabama in conjunction with other organizations, this collection includes maps indexed by state, region, country, continent, and hemisphere. Particularly helpful are maps organized by topics, such as the American Revolution, the Mississippi River, Native Americans, and railroads. Developed by the Library of Congress from its Geography and Maps Division, this is a treasure trove of American maps. The maps are conveniently organized by topics and indexed by geographic location and subject. The collection includes searchable Sanborn Fire Insurance Maps (under the “Cities and Towns” tab). This large online collection of world and U.S. maps has been created by the University of Texas at Austin. Historical city and state maps and topographic maps are some of the highlights for genealogists. All states and regions of the world are represented, although the collection is particularly strong for Texas. This international collection of antiquarian maps is indexed chronologically and by continent. The website also includes a number of historical documents and helpful history research tools. The Boston Public Library has made this impressive collection of U.S. and world historical maps available. Maps may be downloaded at no cost, or you can purchase high quality reproductions. This collection includes antiquarian maps, U.S. property atlases, and Canada and world maps. Maps are organized geographically and by points of interest (such as cemeteries, hospitals, streams, etc.). While you can view an image freely online, you must register and pay to download or print a watermarked image. If you find your ancestor’s name on a township map, as I did, however, you may not mind the $1 print charge. Subscriptions are available. The Newberry Library in Chicago has developed an awesome tool for finding U.S. county boundaries through the years on this interactive website. After a quick read-through of the directions on their “Using the Atlas” page, you’ll be off and running. You can print the maps for your own use, and can download files to use with Google Earth and Google Maps. Randy Majors has also constructed a tool to show historical U.S. county boundary maps and world boundary maps in an easy-to-use interface. This U.K.-based site essentially serves as a search engine to find historical maps on your geographic area of interest. Collections searched include the British Library, Moravian Library (Czech Republic), National Library of Scotland, and the New York Public Library. A large number of public domain map images, useful for blogs and publications, broken down by categories. Maps of other countries are also available on Wikimedia Commons. There are many more historical map collections available online, many of which specialize in a particular area. I love discovering new ones. Which are your favorites? Do you know of a map collection or map tool I should explore? 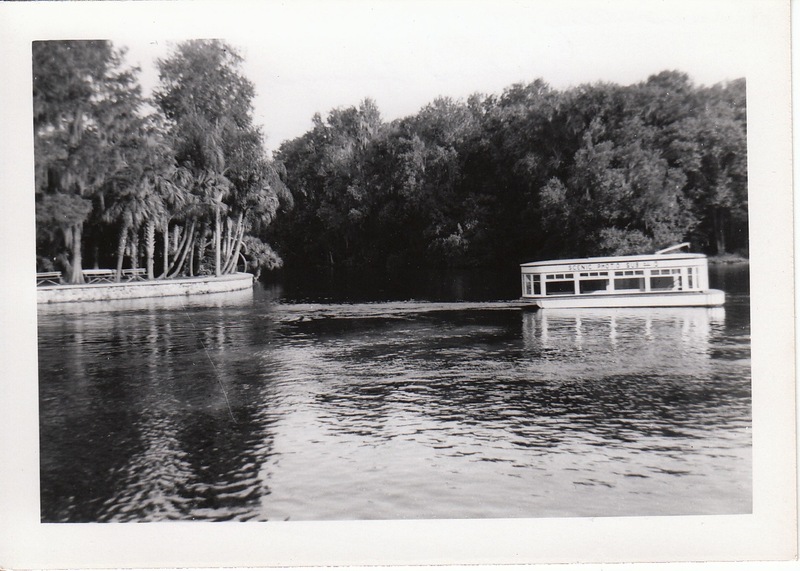 These photographs of the glass-bottomed sightseeing boats at Silver Springs near Ocala, Florida, were taken in 1952 by Leatha Evans Baxter, my husband’s grandmother. 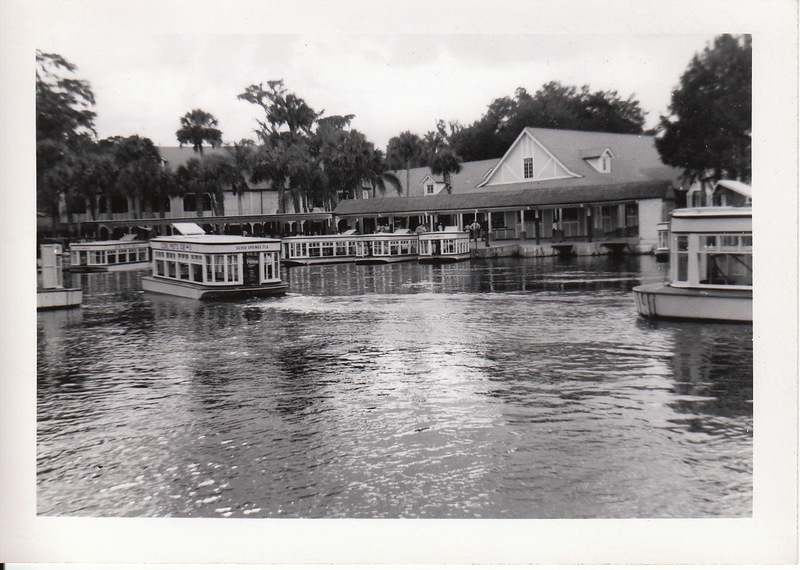 The boats were—and continue to be—a popular feature at this lovely vintage Florida tourist park. 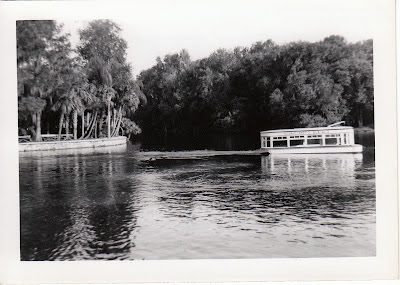 Stay tuned for some more pictures of Silver Springs through the decades. What summer plans? 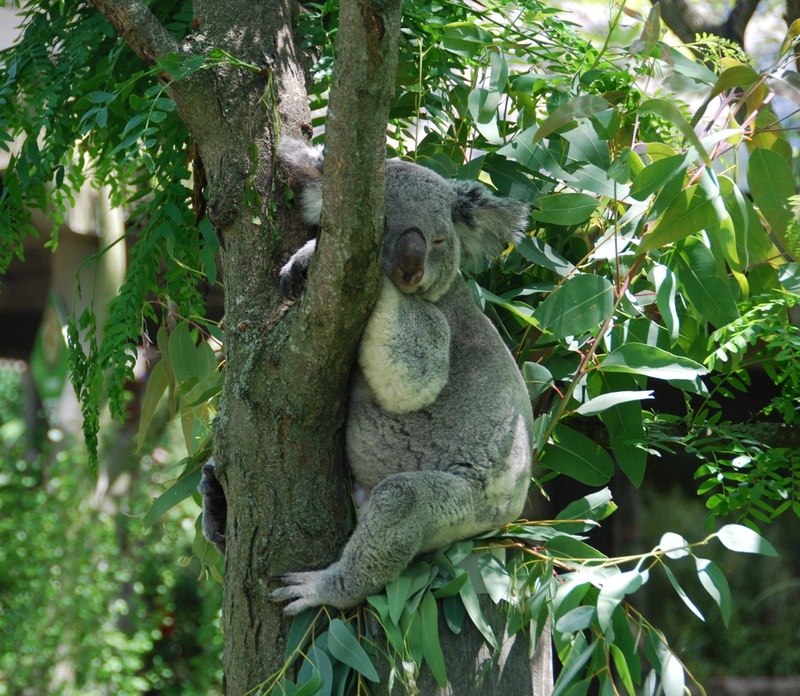 This koala at the Columbus Zoo knows how to take it easy. I can’t believe we’re nearly halfway through 2012 already. The year is flying by, isn’t it? The last two months have been busy ones for me, highlighted by the OGS Conference in Cleveland and the NGS Conference in Cincinnati. 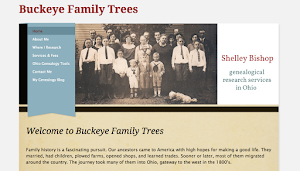 I got the website for my genealogy business, Buckeye Family Trees, up and running, which was a huge goal. It seems like a good time to pause for a minute and take a look at where I’m at and what I want to work on in the summer months. Create a research plan to explore who Michael Herrel was, and what relationship (if any) he had to my great-great-grandfather, John George Herrel. In my quest to identify John’s parents and place of origin in Germany, I’m finding it necessary to research all of the Herrels living in Cincinnati, Ohio in the 1880s and 1890s. I’m excited to try some of the reporting, correlation, and analysis techniques for FAN research (friends, associates, neighbors) presented by Elizabeth Shown Mills and David Ouimette in their excellent lectures at NGS. Begin documenting my Ballenger, Clark, and Eberhard ancestors for my application to the OGS Century Families of Ohio lineage society. Find places for everything in my new home office (previously my older daughter’s bedroom, and now our guest room/office). I hate to admit it, but I have stacks of papers, brochures, and stuff from conferences and research trips that have been accumulating in piles in my dining room. I don’t want to bring those into my nice clean room without sorting and weeding them out. Then I need to file and organize what I want to keep. My goal is to be “pile-free” by the end of the summer. 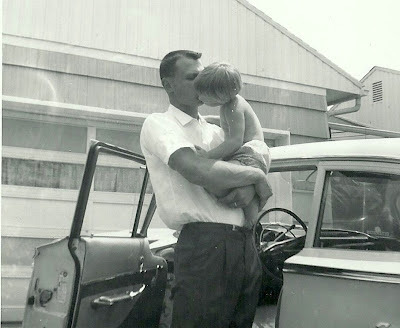 I’m inspired by Michelle Goodrum’s posts for the 21st Century Organized Family Historian. Write eight blog posts a month. Write monthly articles and blog posts for The In-Depth Genealogist. 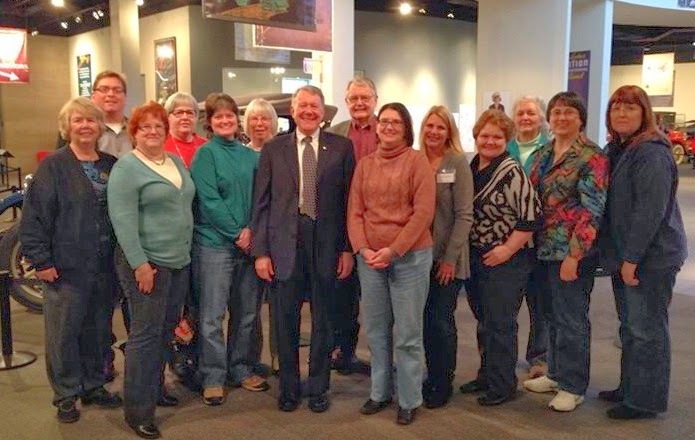 Attend at least two days of the Ohio Genealogical Society Summer Workshop, which is being held June 18-22 at the OGS Library. I’d like to go the entire week, but will have to see if my schedule permits. Participate in the Advanced Research Methods course, coordinated by Dr. Thomas Jones, at the Genealogical Research Institute of Pittsburgh (GRIP) from July 22-27. Although I expect to work hard, I’m excited about this course and the whole experience of GRIP. Listen and take notes on one webinar each month. Along with client research and my volunteer responsibilities, that should be more than enough to keep me busy this summer. I’d love to hear your plans. What do you hope summer will hold for you?